Everything was different in 2007: people listened to music on iPods, the final Harry Potter book came out, and if you wanted a top-of-the-range phone then it was going to come with a physical keyboard. Then, Apple launched the iPhone, and everything changed. It's easy to forget, though, that this change didn't happen overnight. Not everyone was convinced by the new touchscreen approach, or by browsing the web on a phone, and the very first Apple iPhone had quite a few limitations, some of which we've listed below. Of course we're still huge fans of the iPhone, no matter which model we're talking about - but it's worth remembering that it wasn't quite perfect right from day one, and the phone's rise to prominence took a few more iterations than you might have thought. The first iPhone only ran Apple software: no Snapchat, no Facebook, no Gmail. It wasn't until the year after that Apple developed the framework necessary for third-party developers to get involved, and it was then that the smartphone era really began. To begin with, iPhones could only connect to 2G and 2.5G networks, as they were known then - that meant very limited browsing away from a Wi-Fi connection. 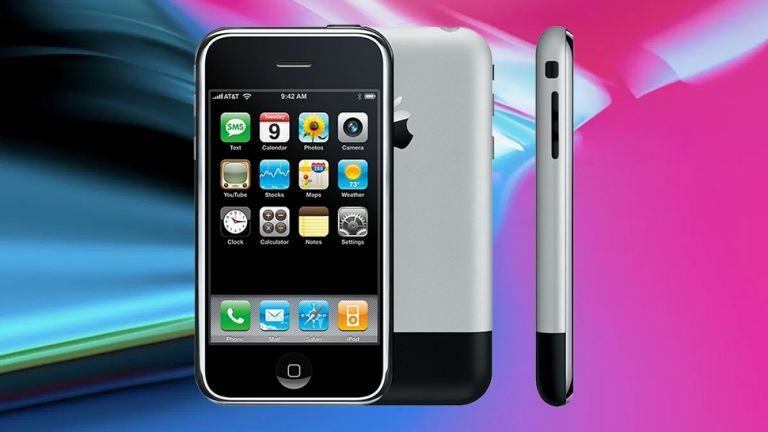 The second iPhone, launched the following year, was called the iPhone 3G to flag up its faster data speeds. This was quite a big bugbear for early iPhone users: the fact that you couldn't copy one bit of text from one part of the screen and paste it on another. It wouldn't be until two years later, in June 2009, before iPhone owners could start copying and pasting on their devices. It's quite a small feature, and often forgotten, but the very first iPhone had one fixed wallpaper - that blue globe picture. Even then the image was only allowed on the lock screen, and behind your row of app icons there was nothing but an empty black space. No one really bothers with Multimedia Messages (MMS) in the age of WhatsApp and Facebook, but in 2007 a lack of MMS support was quite a big deal - and if you owned the first iPhone, then you were stuck on plain old text messages to get your point across. We're now pretty much used to the iPhone not having expandable memory, but it was quite a notable move at the time, especially as the cheapest model had just 4GB of on-board storage. This is one of those omissions Apple hasn't seen fit to fix just yet. Another one of those big-for-2007 decisions, but Apple has been vindicated here, with Flash now all but dead. Back when the iPhone first appeared though, much of the interactive web relied on Adobe Flash, and its absence was seen as a problem by some. Our phones might be fully fledged movie-making studios in 2017, but the original iPhone couldn't shoot video - only photos. To be fair to Apple, this was still early days for mobile phone photography, but some of its cheaper rivals (like the Nokia N95) could shoot video. Back in 2007, selfies weren't really a thing - and nor was FaceTime, and nor were front-facing cameras, which the first iPhone didn't have (and the Nokia N95 did...). If you wanted a photo of yourself, you had to go to the effort of turning your phone around. The first iPhone didn't have a GPS chip, though it could try and roughly work out where you were based on cell towers and Wi-Fi data using something called Skyhook, which Apple later replaced. It carried a rudimentary version of Google Maps, made by Apple using Google data, that according to tech lore was hobbled together in three weeks. While we're casting our minds back through history, we might as well recap all of the iPhone's specs for you. The screen stretched a mere 3.5 inches from corner to corner, carrying a resolution of 320 x 840 pixels - you could fit 15 of them in the iPhone X display. A single-core 620MHz Samsung CPU was backed by 128MB of RAM and the phone came rocking a 1,400mAh battery. As for that all-important rear-facing camera, it boasted a 2.0 megapixel resolution, and you got a USB port and a 3.5mm audio port thrown in too. Has AirPods 2 release date guaranteed Apple will finally launch AirPower today?